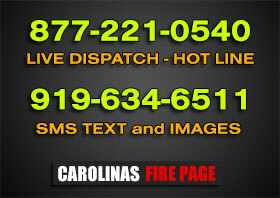 NASH COUNTY, NC – Shortly before 7 p.m. on April 19, the Nash County 911 Center started receiving calls for a dwelling fire in the 2600 block of Old Bailey Highway. Fire crews from Nashville Station 14, Coopers Station 15 and Momeyer, Station 17 along with Nash EMS were dispatched. Fire dispatch informed all companies that they were responding to a working fire with flames coming from the roof. Gallery photos courtesy Bob Bartosz. Upon arrival, firefighters encountered a fully involved attached garage with fire spreading to a 1 1/2-story brick dwelling. The living area of the home was in excess of 4,000 square feet and was about a quarter involved in fire. Fire command ordered a transitional fire attack and Engine 14 led off with a step gun supplied with a 3-inch line. A second line 2 1/2-inch with a 1 1/4-inch smoothbore nozzle was pulled to assist in knocking down the bulk of the garage fire. A car was also burning inside the garage. The next arriving crews prepared to enter the structure from side A and firefighters used a 2-inch attack to knock down most of the fire in the kitchen area and stopping the spread of the fire. An additional 1 3/4-inch line was advanced to the second floor to check for extension. Being located in the rural area of the fire district, a water supply was established utilizing two dump tanks. A tanker shuttle was set up to haul water from a fire hydrant over a mile away. A tanker from Stanhope Station 19 was also summoned and during the first 15 minutes of operation a fire flow of between 500 and 700 gpm was sustained. Approximately 30 percent of the structure was destroyed by fire with the balance having significant smoke and heat damage. Damage exceeded $500,000 and the cause was determined to be unattended cooking. The fire was declared under control 20 minutes after the interior attack had begun. Crews from Red Oak Station 12 and West Mount Station 4 provided standby coverage for departments at the scene. Article by Nashville Fire Department Fire Chief Randy Goodbrod, as submitted by Bob Bartosz.